This is produced by Spirit Juice. Let me know what you think. Irondale, AL (EWTN) – As details of genocide of 800,000 Tutsis and moderate Hutus began leaking out of Rwanda in 1994, the secular media and Hollywood jumped on the story and dozens of films were made, including the award-winning “Hotel Rwanda.” But who is making a film documenting the “religious cleansing” of hundreds of thousands of Christians in the Middle East? Who is courageous enough to brave the possibility of being beheaded, burned alive or crucified, to bring the world the voices of those Christians whom Muslim extremists have been hunting off the face of the earth? Enter intrepid Italian filmmaker Elisabetta Valgiusti, who traveled to Erbil in Kurdistan, site of U.S. bombing against ISIS, in late 2014 to film an EWTN Original Documentary, “Voices of the Persecuted: Nineveh’s Christians in Exile.” See the extraordinary results of this investigative journalist’s work at 10 p.m. ET, Wednesday, April 1. If you want to know more about what is happening with Christians in the Middle East, do not miss this program. During the documentary, you will learn about the fate of the quarter million Christians in Nineveh who miraculously escaped the invading ISIS terrorists on the night of August 6, 2014, with nothing but the clothes on their backs. Bishop Habash believes that the slaughter of so many of his countrymen has left no more than 300,000 to 350,000 Christians in the Middle East. Most are living in terrible conditions in Erbil. The question is: What can be done? Bishop Habash has some answers. To find out more, tune in Wednesday, April 1 at 8 p.m. ET to “EWTN Live” and at 10 p.m. ET for this extraordinary documentary. Note: For information on helping with the relief efforts on behalf of persecuted Christians in the Middle East, please visit www.caritas.org and Aid to the Church in Need, http://bit.ly/1DU8P4x. To purchase your copy of “Voices of the Persecuted” to show to your friends, family, and Church groups, please go to http://bit.ly/1HsDCmS. EWTN Global Catholic Network, in its 34th year, is available in over 238 million television households in more than 140 countries and territories. With its direct broadcast satellite television and radio services, AM & FM radio networks, worldwide short-wave radio station, Internet website www.ewtn.com, electronic and print news services, and publishing arm, EWTN is the largest religious media network in the world. 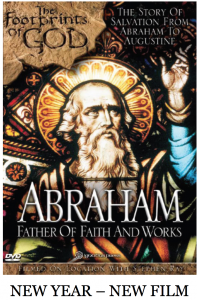 After eight years of waiting — ABRAHAM, FATHER OF FAITH & WORKS is now shipping! You can order it HERE! Filmed on location in Iraq, Turkey, Israel and the Palestinian Territories. Learn things you never knew about our Father of Faith. 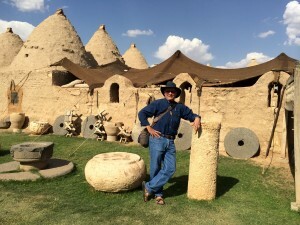 Camels, donkeys, goats and sheep — sacrifices, typology, flint knives and ancient temples. How are we saved? What does God expect of us? In Haran Turkey where Abram lived on his way to Canaan! What gods did Abraham serve before God called him? What is a ziggurat? How is Isaac a picture of Jesus? Where did Abraham offer up his son Isaac? Special deal if you buy all eight DVD’s now available! See all Steve’s products in our store HERE!